The mining of Kenya’s coal deposits has started in earnest in line with Kenya’s aspiration to become a middle-income industrialized country by the year 2030. A key element in reaching this goal is the generation of energy to power industries and making electricity more widely accessible to the population in Kenya. While the government is making key investments in renewable energy, coal is part of the increased energy generation strategy. The construction of the country’s first coal-fired power plant was approved by the National government in 2013. Although the plant will initially use imported coal from South Africa and Mozambique, the plant will subsequently use locally sourced coal, mainly from the Mui Basin in Kitui County. Other attempts to locate coal resources are underway, including in the coastal Counties, namely, Kilifi, Kwale and Tana River. 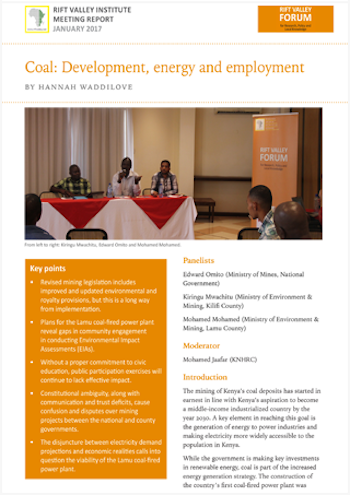 On 5 December 2016, the Rift Valley Forum and Mombasa-based Human Rights Agenda (HURIA), hosted a public forum to discuss the dynamics of this development and the role of the county governments in addressing the social, environmental and economic impacts of coal- related activities on the Coast.